Three million Flip users cast aside when Cisco shut down its handycam division last year will get a helping hand from Givit, a private video sharing service that will provide support for FlipShare, the exclusive Flip camera sharing network. Givit will connect into FlipShare, and eventually take over the soon-to-be-defunct FlipShare service next year. Givit is best described as the private counterpart to FlipShare. The platform-agnostic video-uploading service is currently available on iOS, Android, PC, Mac and browsers. The Flip camera and its support will end on December 2013, and so will FlipShare. At that point, Givit will take over support of all uploaded FlipShare videos. 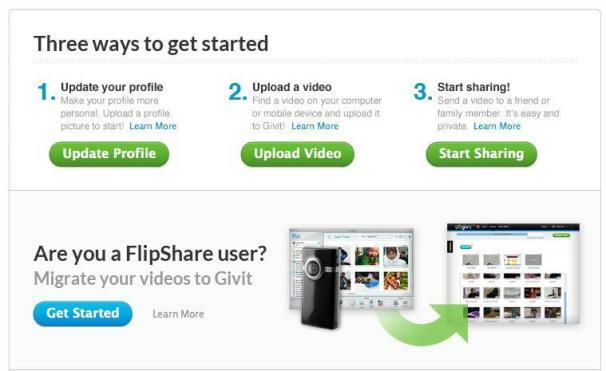 According to Givit, users will have 30 days to transfer their FlipShare videos to Givit with one click. Despite its popularity, the Flip officially stopped production nearly a year ago. Interested in refocusing its brand, Cisco fired the 550 Flip employees and closed the division. High-end, multifaceted video devices like the iPhone added to Flip’s competition in recent years. Givit is currently available now and will be integrating into FlipShare in the near future. FlipShare will remain fully functional.